Dropped like a Hatputito: FarmOn 2.0 | What's it About? To distinguish the old and new FarmOn investment, I will call it 1.0 and 2.0 from here on. So what is FarmOn 2.0 all about? It is no secret to FarmOners (if you've been active in the support group or even in FarmOn's FB page), that there were lots of complaints for the past cycles because of the decreasing rate of return on investments, longer harvest time for crops, less choices of products, difficult access to website during investment season, etc. In summary, Farmon 2.0 is now introduced to address issues encountered from 1.0. 1. Some FarmOners worry about having limited ROI or having their product being replanted. Their fund will now be managed by an in-house fund manager who knows what project is a potential high earner. FarmOners' fund will also be spread to the six (6) different projects of FarmOn, hence, the chances of earning is more imminent. 3. 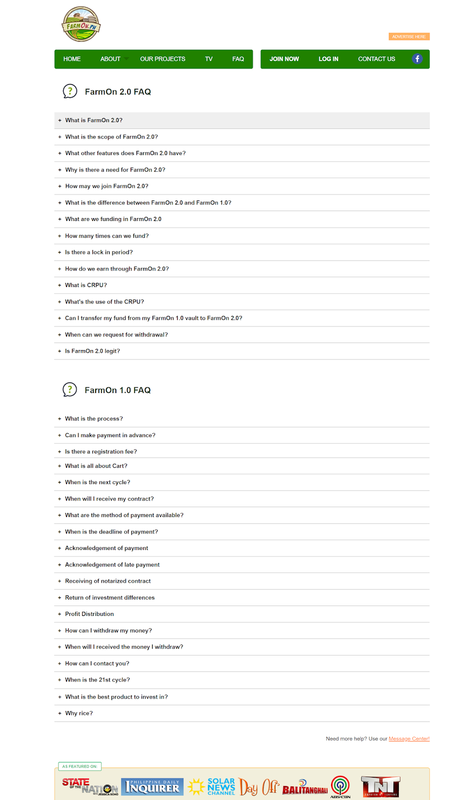 Funding is done only during specific seasons in FarmOn 1.0. Until any product is open, your fund remains dormant. 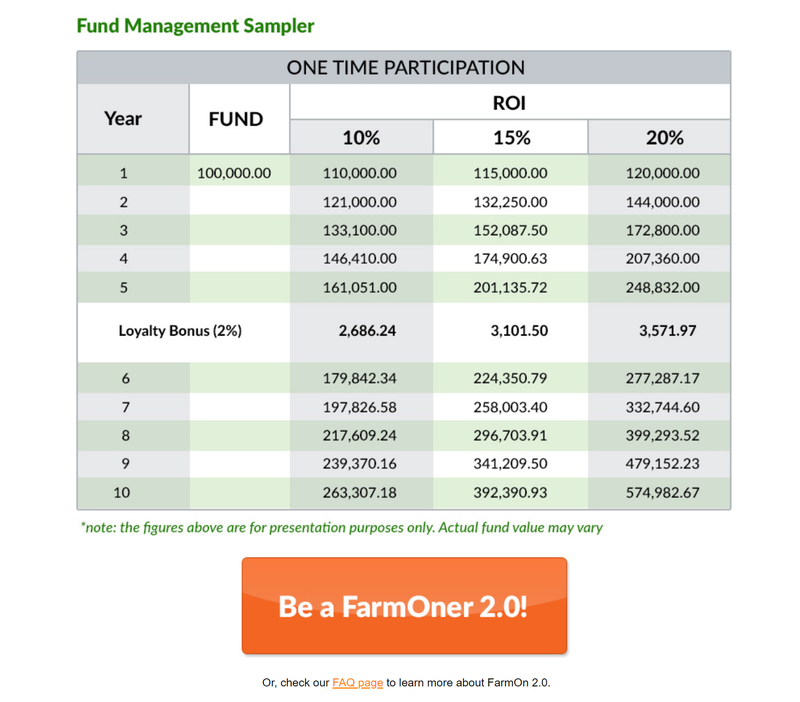 In FarmOn 2.0, you can let your fund grow as soon as you wanted to." To which they claimed: This will totally eradicate the hit and miss problem that some FarmOners have experienced before when they funded a product that did not provide them with good ROI. So how does 2.0 work? Registration is basically the same with 1.0. When you click on the Become a FarmOner 2.0! button, you will be redirected to the login page. 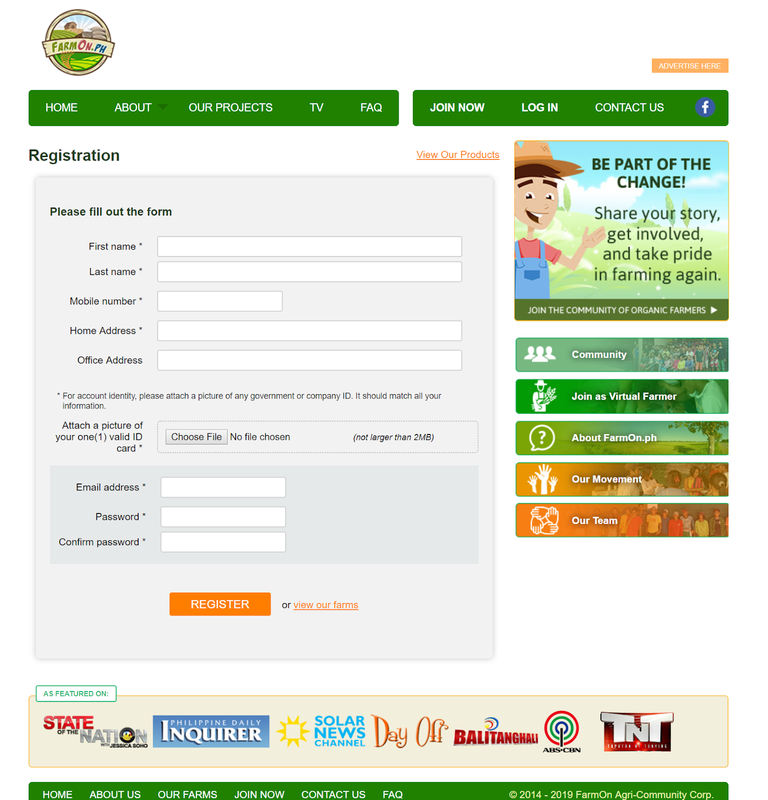 If you don't have an account yet, you can register by clicking on the Register here link. And this is the same registration page for 1.0. But the investment is different. For 2.0, FarmOners will no longer need to choose any. FarmOn's in-house fund manager will handle the fund and he will spread it o the six (6) different projects of FarmOn. That way, as FarmOn stated in the FAQ, the probability of not earning or not being able to receive ROI on time will be limited tremendously. Participation will no longer be on rice farming per se. As you can see in FarmOn's product page which is now called Our Projects, 2.0 is not about the lot/plots where farmers will be planting but instead it is described as "Technology and Mechanization". It is also Open, because it will be an all-year round investment. Meaning you can invest anytime to it whenever you are ready and have the funds for it. It is virtually open all the time, as they said. There is no lock-in period for the investment, but keep in mind that 2.0 is a long-term investment. Ideally, a 5-year one to enjoy the benefit of the program. But just in case an emergency arises and FarmOners will need their funds, withdrawal can be requested six (6) months after funding the project. 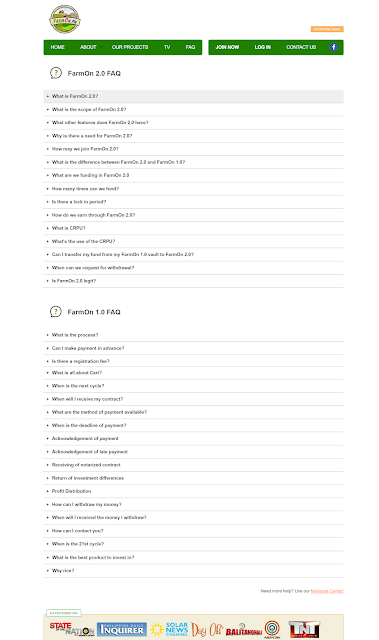 For the existing FarmOners of 1.0, we have the option to transfer our funds to 2.0. The process is I think just like the reinvestment one where we go to the Our Projects (before was Product Page), choose 2.0 and follow the process as is. So how much is this 2.0 project? Great news for small time investors, the price per unit is Php 100. I will update this or make a new post in the future for additional information about their new project.